The Big Bang theory explains how the universe started in a scientific way. According to this, many astronomers believe that the universe started about 14 billion years ago in a big bang. Our entire universe was believed to be inside an extremely small and dense bubble. All of a sudden, it exploded and since then, it kept on growing at an amazingly high rate. This explosion created a very hot, but very small, ball of energy and matter. All scientists believe that at the time of the Big Bang, space, energy and all of the building blocks of life came into existence. Many scientists like Stephen Hawking, George Ellis etc. have researched the Big Bang Theory. In the 1920s, famous astronomer Edwin Hubble discovered that the universe is not static. It keeps expanding and contracting. We live in a Multiverse. There are many other universes that exist apart from our universe. Apart from Milky Way, there are many other galaxies as well. The mystery still remains about what caused the Big Bang. Most recent observations tell us that the expansion of the universe is getting faster over time. 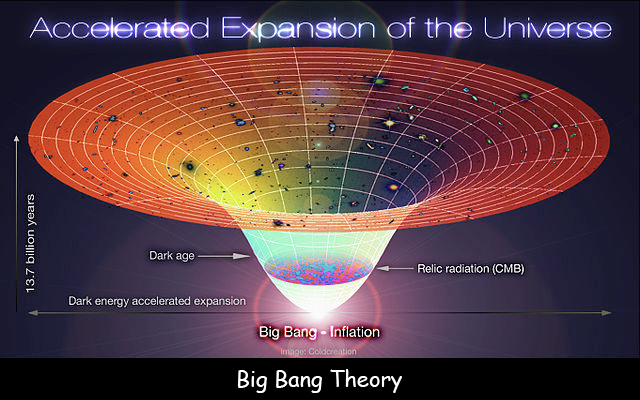 Big Bang is an idea that does a pretty good job of describing the history of the Universe. The energy released from the explosion changed into particles of matter and antimatter. A few scientists also believe that there was a universe before the Big Bang.